What is your favorite raccoon family member? What's your favorite member of the raccoon family? My favorite is the Coatimundi,but I also think Kinkajous, Common Raccoons, and Ringtail cats are adorable and of course Red Pandas are really cute. Ringtails, but I'd have a hard time turning down a red panda if offered. Sorry guys. I was a little rusty on my raccoon family knowlegde. I just learned there's another member called an Olingo. 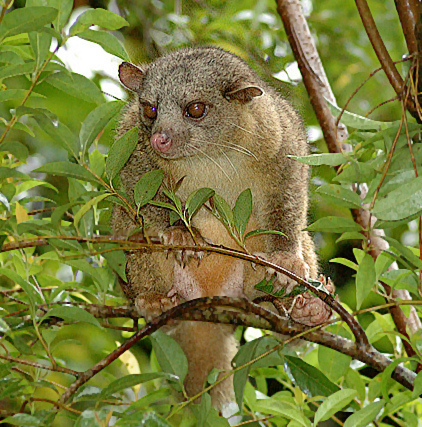 It looks like a cross between a bush baby and a kinkajou. So, I'm adding it to the poll now even though it looks pretty much identical to the kinkajou. Urrgh. I can't edit the poll anymore. So, you can just post if you want to choose it,but I doubt anyone will since it's not well known and looks alot like a kinkajou anyway. But then maybe someone will chose it. You never know. Just sayin. Also, just found out there's a 3rd type of raccoon. The Cozumel raccoon. It's critically endangered though so probably not allowed as a pet,but you can just pick the Common Raccoon/Crab-eating Raccoon choice if you want it and pretend like it says Common Raccoon/Crab-eating Raccoon/Cozumel Raccoon. Of course, I chose raccoon :) I didn't really think of them as being cute (not ugly, just neutral I guess) until I got mine and then it's like OMGCUDDLESNOW every time I look at his face. Agggh so cute. He isn't cuddly unfortunately but sometimes enjoys pettings and will sit with me (often digging through my pockets to get my phone or playing with the button on my jeans). For being cute it's the red panda. For wanting as a pet, it's the ringtail. But for all around niftiness it has to be the raccoon, and so I voted. Also, I'm not actually seeing the olingo option.